In addition to the competitors above, Sutherlin FFA brought along a Farm Business Management team (another new competition for the chapter), and Keaten Clarno competed in the State Cooperative Quiz and Interview. Tristan Vincent, Lacie Head, Raichel Wolfe, and Skyler Harrington were recognized on stage for earning their State Degrees. The State Degree is the highest degree which can be awarded by the Oregon FFA Association. Madelyn Higgins was brought on stage as well for her swine proficiency. 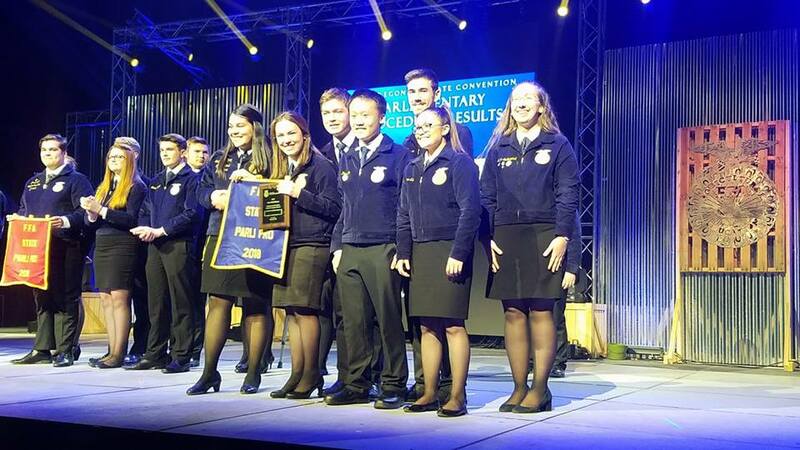 During State Convention, the six state officers who have been serving Oregon FFA for the past year delivered their retiring addresses. Sterling Foster went on stage to introduce Gabby Santa Cruz and Tristan Vincent introduced past Sutherlin FFA member, and State Reporter Lee Wesenberg. Both of them spoke very eloquently. Sutherlin had several members run for different offices during State Convention. Nolan Carson and Regan Leatherwood both gave speeches for the Umpqua District Officer elections. Nolan Carson was voted for the position of President. Mackenzie Price and Madelyn Higgins both decided to undertake the incredible journey of running for State Office. Their weekend was filled with interviews and other events. 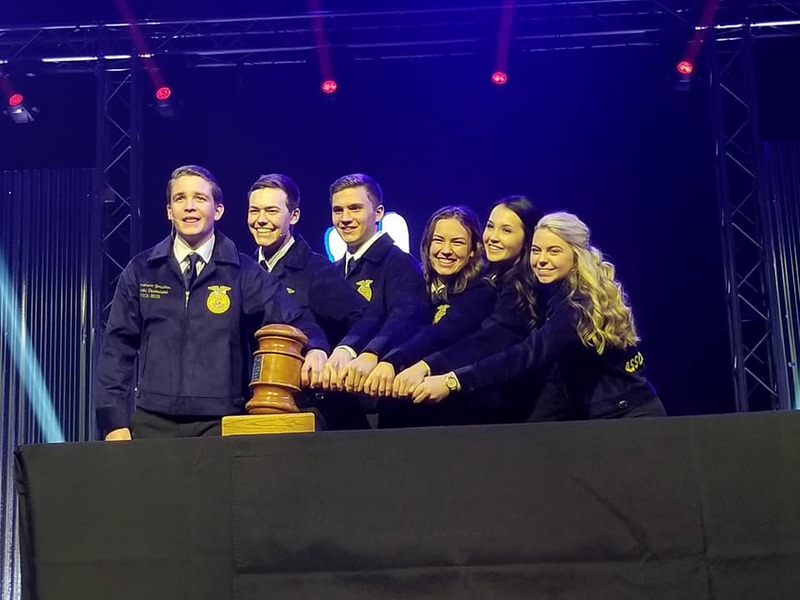 Finally, on Monday morning during an early delegate session, Mackenzie Price was elected as the 2018-19 Oregon FFA State Treasurer. She is the fourth consecutive State Officer form the Sutherlin FFA Chapter since 2015. 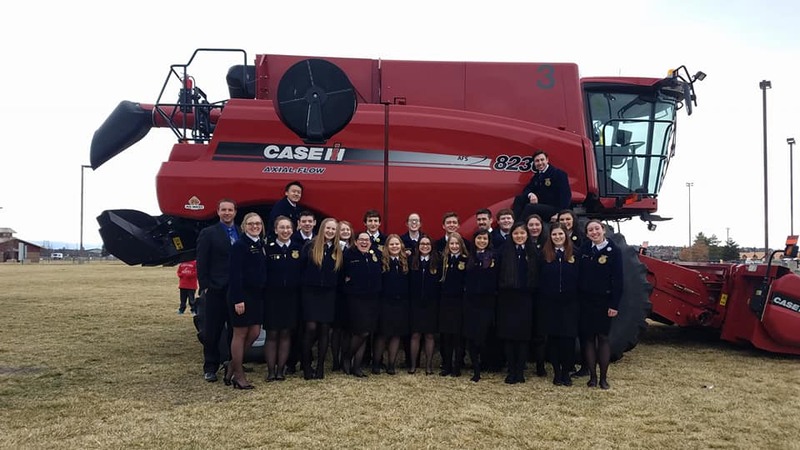 The Sutherlin FFA Chapter made its school and community proud at this year’s Oregon FFA State Convention. In addition the incredible success of the students, Mr. Crawford was recognized as Oregon’s Agricultural Educator of the year. It is important to remember that this success is the result of a year of intense effort and hard work on the part of the whole chapter. Good luck to Mackenzie Price in her State Office endeavors and to the Parliamentary Procedure team at National Convention. The Advanced Parliamentary Procedure team accepts their first place banner on stage. The newly elected 2018-2019 Oregon FFA State Officer team.